Yes! it's another giveaway to celebrate the new year. 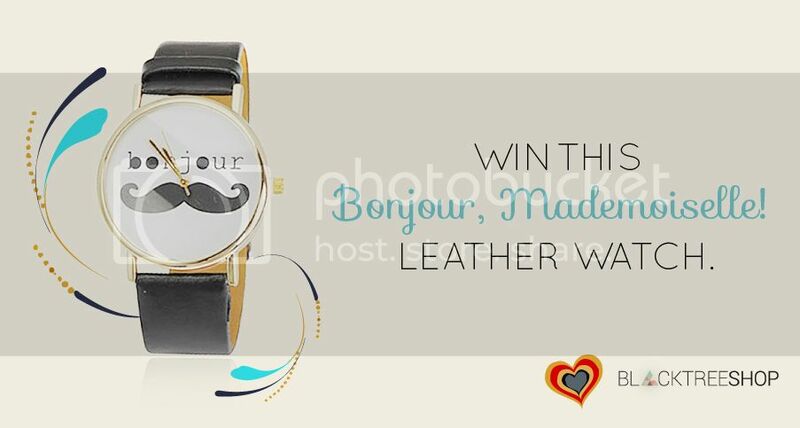 Blacktree shop is sponsoring an adorable bonjour mademoiselle watch in black for one lucky winner. With the infamous moustache icon and pu leather strap, it gives preppy and fashionable parisian vintage feel, great for everyday wear. Blacktree Shop is a curated online boutique based in Indonesia that specialized in jewellery. It has unique and edgy jewellery and accesories collection that suits different style. Pre order system is required for the pieces, and the valentine edition has just opened. So go to their page and don't miss out! I am following via GFC and liked the page on Facebook! and I'm Following you via BlogLovin' too..
thanks for tis giveaway ! seriously fhenny that watch is the cutest. following Blacktree Shop's twitter done! cute watch! i followed GFC and liked the fanpage :) hope can win this! nice blog sis ☺ wanna follow each other maybe ? Cute watch :) Thanks for this giveaway :)I am followed you via GFC and bloglovin. liked the page on Facebook! I just start tweeting! <3 I love this, really!